La-Pha-Pack offers a complete range of consumables for HPLC, GC, and Headspace Analysis comprising of vials, septa, seals, filters, crimpers and other accessories. Besides all standard items for almost all common instruments in the chromatography market, La-Pha-Pack® also carry out special production runs of vials, septa and combination seals according to customer specifications.La-Pha-Pack are the only supplier of chromatography vials from a class 10,000 cleanroom. With the CleanPack label on the box the products are guaranteeed for high hygienic standards, tamper-proof packaging . The vials are made out of 1st hydrolytic class glass and undergo inspection as per DIN/ISO standards assuring superior product quality for reliable chromatography analysis. La-Pha-Pack makes a vast array of autosampler vials to suit every model of HPLC/GC available in the modern analytical laboratory- Shimadzu, Agilent, Waters, Thermo Scientific, Varian etc. 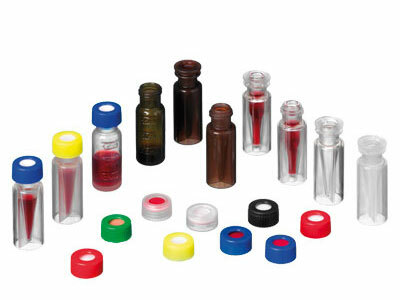 Vials with Screw Necks as well as Crimp neck vials are offered to various specifications- clear, amber & graduated. Provide risk-free injection of the needle, safe handling during filling as well as excellent sealing of the sample container. Crystal-clear TPX offers good transparency and chemical resistance. Can also be supplied with silanized MicroInserts. Universally compatible on almost autosamplers, thereby rationalization of other 1.5ml vials, 11 Crimp Neck Vials, Screw Neck Vials 8-425 and 10-425 . PE Plugs for fixation of a MicroInsert without any need for springs. d) Plastic Vials and Plastic MicroVials. Main applications for Plastic Vials are atomic absorption, water and protein analysis, capillary electrophoresis, ion chromatography etc. 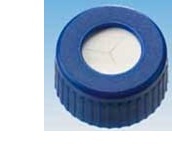 1.5ml Polypropylene Short Thread Vial with slightly concave shaped bottom. Usable in HPLC as a possible alternative to silanized glass vials for pH sensitive and aqueous samples. Characterized by a slightly concav shaped inner bottom that reduces dead volume and offers ideal conditions for the needle for sample pick up. Various Liner Options- Butyl, Butyl/PTFE, Pharma-Fix Liner ( Butyl/PTFE), Silicone/PTFE, Silicone/Aluminium Foil, Viton, Natural Rubber/TEF. PRE-CUT Septa for HPLC Applications. La-Pha-Pack has developed pre-cut septa to prevent the risks of concentration change and contamination through extraction, faced in conventional septa. The Silicone carrier material is cut through in a Y-form with the PTFE lamination remaining intact. The intact PTFE lamination gives 100 per cent protection to the sample and the Y-form of the pre-cut allows a better flow of air during sample pick up and improves the whole injection process. Various options on the carrier materials are offered in the septa- Natural rubber, TEF, Red Rubber/PTFE, Silicone/PTFE, to meet challenging requirements - multiple injections, temperature, thin/fragile needle, blunt/thick needle, critical analysis, low coring etc.